Acquisition part of $60 million investment in Honolulu terminal improvements. Matson has received three new 65 long-ton capacity gantry cranes at its Honolulu hub terminal at Sand Island. 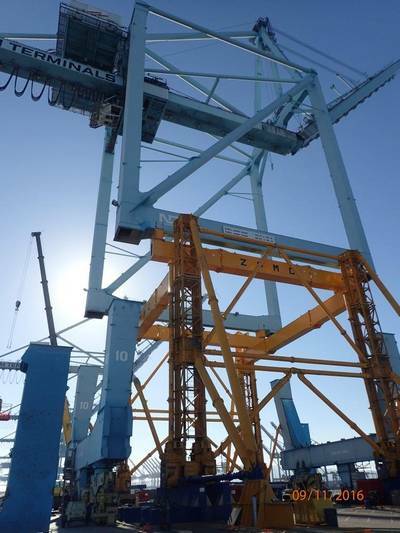 The biggest ship-to-shore container cranes to be deployed at any commercial harbor in Hawaii, the cranes arrived aboard a special heavy-lift vessel on Saturday and were positioned for discharge starting this morning. Matson's acquisition of the new cranes, along with the upgrading of three existing cranes and other improvements, is part of a multi-year $60 million terminal expansion and modernization project at its hub that is tied to the deployment of four new ships between 2018 and 2020. Built for Matson by Mitsui Engineering & Shipbuilding, the new cranes weigh approximately 1,290 tons each and will have greater lifting capacity, height and reach than existing cranes, which will enable full service of Matson's new, larger ships. Discharging the new cranes from ship to shore involves a nearly week long process, including the deployment of special rails on which the cranes will roll off the delivery vessel and onto Matson's dock. The new cranes are expected to go into service in the third quarter of this year, after the removal of structural bracing installed for the cranes' ocean delivery, extensive testing of each crane's main functions and technology, certification with various weights and the final commissioning of each crane.